American aviator who is famous for making the first nonstop solo flight across the Atlantic (1927). Lindbergh left New York for Paris, carrying sandwiches and water. He fought fog, icing and drowsiness, and landed in Paris 33½ hours later after his 3,600 mile flight. Decades spent in contact with science and its vehicles have directed my mind and senses to areas beyond their reach. 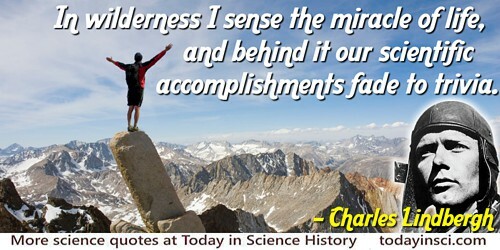 I now see scientific accomplishments as a path, not an end; a path leading to and disappearing in mystery. Science, in fact, forms many paths branching from the trunk of human progress; and on every periphery they end in the miraculous. Following these paths far enough, one must eventually conclude that science itself is a miracle—like the awareness of man arising from and then disappearing in the apparent nothingness of space. Rather than nullifying religion and proving that “God is dead,” science enhances spiritual values by revealing the magnitudes and minitudes—from cosmos to atom—through which man extends and of which he is composed. A Letter From Lindbergh', Life (4 Jul 1969), 60B. In Eugene C. Gerhart, Quote it Completely! (1998), 409. In 'Is Civilization Progress? ', Reader’s Digest (Jul 1964). If I were entering adulthood now instead of in the environment of fifty years ago, I would choose a career that kept me in touch with nature more than science. … Too few natural areas remain; both by intent and by indifference we have insulated ourselves from the wilderness that produced us. If we can combine our knowledge of science with the wisdom of wildness, if we can nurture civilization through roots in the primitive, man’s potentialities appear to be unbounded, Through this evolving awareness, and his awareness of that awareness, he can emerge with the miraculous—to which we can attach what better name than “God”? And in this merging, as long sensed by intuition but still only vaguely perceived by rationality, experience may travel without need for accompanying life. A Letter From Lindbergh', Life (4 Jul 1969), 61. In Eugene C. Gerhart, Quote it Completely! (1998), 409. Declaring a preference for contact with nature rather than with technology. In 'The Wisdom of Wilderness', Life (22 Dec 1967), 63, No. 25, 10. Our ideals. laws and customs should he based on the proposition that each, in turn, becomes the custodian rather than the absolute owner of our resources and each generation has the obligation to pass this inheritance on to the future. [I] grew up as a disciple of science. I know its fascination. I have felt the godlike power man derives from his machines. As for Lindbergh, another eminent servant of science, all he proved by his gaudy flight across the Atlantic was that God takes care of those who have been so fortunate as to come into the world foolish. Expressing skepticism that adventure does not necessarily contribute to scientific knowledge. 'Penguin's Eggs'. From the American Mercury (Sep 1930), 123-24. Reprinted in A Second Mencken Chrestomathy: A New Selection from the Writings of America's Legendary Editor, Critic, and Wit (2006), 167. 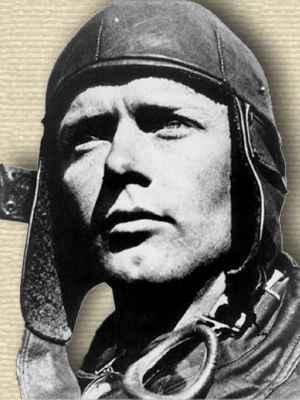 4 Feb - short biography, births, deaths and events on date of Lindbergh's birth. The Spirit of St. Louis, by Charles A. Lindbergh. - book suggestion.